When the Google Home first launched, it was short on integrated services. Since October of last year, Google has slowly and quietly added to the list, including nearly 30 in December. Most of them are silly and not very useful, like one that will convert the age of your cat from human years to cat years, and another that offers up the best dad jokes. Others are more helpful, like Genius, a service from the popular lyric annotation site of the same name that helps users figure out a song based on a portion of the lyrics. Google still has a long way to go to catch up to Amazon and its Alexa platform, but it’s heading in the right direction. The implementation isn’t perfect, you have to tell the Google Assistant you want to talk to each service in order to use it (for example, to use Genius you have to say: “OK Google, talk to Genius”), but it beats having zero functionality. The hope is that by October, the one year anniversary of the Google Home’s release, the amount of services available will be vast. It’s not there yet, but within the 70-plus available today, there are a few that are genuinely interesting. AutoVoice is great for those Android users that like to tinker with their devices to get the most utility out of them. Paired with Tasker, users can use the service to “hack” their Google Home and have it do nearly anything they want. Bummed you couldn’t send messages through Google Home? With AutoVoice you can. Similar to IFTTT, the service works best if you’re willing to in the work. Thus, it’s not for everyone, but if you have the patience and the aptitude it can enhance your experience with Home immensely. Todoist is one of the most popular task apps in the Play Store and now users can add and organize their to-do-lists without even opening the app. If you’re a big list person, and are frustrated by Home’s lack of support when it comes to Google’s own list app, Keep, which limits functionality to merely managing a shopping list, the Todoist service is a great compromise. Tender is great for cocktail inspiration. Whether you’re prepping for a big party, or just looking for a fun drink to enjoy on a Wednesday night while watching The People v. O.J. Simpson on Netflix, Tender has you covered. You can ask for it to recommend a random drink, one based on ingredients you have on hand, what you need to make a specific drink, drinks similar to those you like (like a mojito or old fashioned) and more. Once you settle on the drink you want, the service can then tell you exactly how to make it. Tender offers access to a curated database of 600 recipes and more than 900 ingredients to help you find the perfect drink. 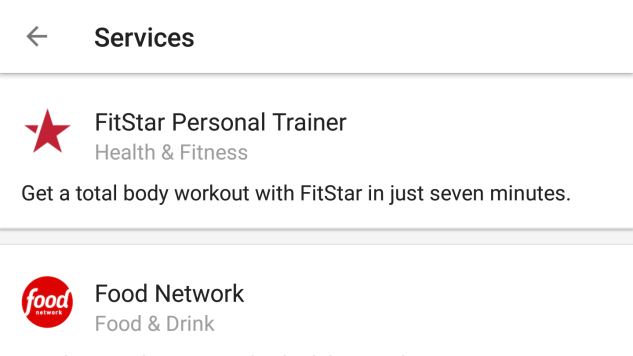 If you’re looking for a quick workout and don’t want to have to fumble with your phone, look no further than FitStar. It doesn’t offer the kind of customization phone-based workout apps do, but it’s effortless to get up and running. In it, you’ll be given a seven minute workout that combines cardio and strength training, led by a virtual trainer that offers instructions and encouragement along the way. Headspace, the popular meditation app, is the perfect companion for Google Home. The service is typically paid, so what’s offered here is restricted to three different meditation sessions that are only two-minutes long. While not robust, it’s the full Headspace experience, just condensed, and a great way to take a few minutes to relax, or center yourself in the middle of a busy day.